This professional duel basket toss carnival game is big and comes with 3 bushel baskets and 6 balls perfect for any carnival or event. This carnival game classic can be used on the ground, on a table or in one of our carnival game booths. This game is much harder than it looks and will be a big hit at any carnival or party and is great for all ages including adults. 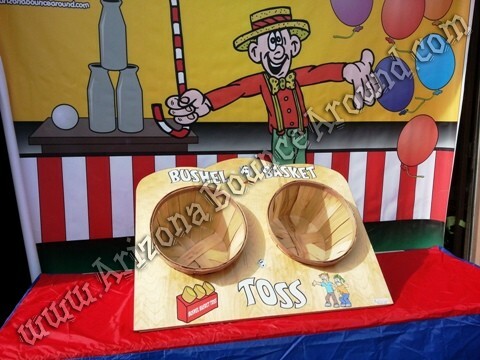 Our bushel basket toss game is shown on an 8 foot table with carnival cover and carnival backdrop that are not included but can be added to your carnival game rental.